The writing style of a cover letter will differ depending on different scenarios. 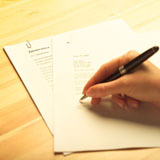 One size does NOT fit all when it comes to cover letters. The purpose of the cover letter is still the same—to get someone to read your resume and call you for a job interview —but the type of document will change depending on different scenarios. There is an enormous difference between the approach in the cover letter for a job seeker with a personal connection and the more formal cover letter applying to a posted job where the document will be read by the HR department or a recruiter. All cover letters include standard features. Certain elements are standard to all cover letters, says recruiter Peter Shrive of Cambridge Management Planning. Cover letters should be original, short, and concise. They should always include your complete contact information since not everyone will immediately turn to your resume. They should not be a recap of information contained in your resume. In the world of electronic resumes and cover letters, they should stand out in the crowd. Cover letters should be very specific, brief, and eye-catching, with a comment designed to make recruiters want to print out your resume and call you in for an interview. According to Shrive, a comment like “I’ve sold 50,000 bottles of wine in my 10 year career as a wine steward," or “I increased wine sales by 20 percent in my last position” will make an HR manager take notice of your cover letter and want to know more about you. After making a comment, you should state clearly how your hospitality career aligns with the position being offered. The personal connection cover letter. Let’s say you’ve met someone who works at a hotel where you’re applying for a front desk clerk position, and that person has agreed to act as an introduction. State up front in your letter: “George Johnson, a manager at your hotel, mentioned to me last week that you agreed to meet with me next Tuesday.” The personal connection cover letter always requires a specific reminder of who you are and what the connection is. Never assume your prospective employer knows who you are without jogging his or her memory. This cover letter, designed to be read by recruiters and HR departments, is a much more formal document, stating up front the job posting information, including job ID number, and the specifics of the posting. For instance, "Job Listing #218, Hotel Front Desk Clerk for a small facility, responsible for greeting and signing in guests. Job requires customer service skills and organizational abilities." For something completely different … the handwritten cover letter. The handwritten cover letter adds a personal touch. When writing a handwritten cover letter, be sure that your handwriting is legible, contains no grammatical or spelling errors, and includes all the information you would include in a typed cover letter. In addition, make sure your cover letter is short, focused, and relates to the employer's job opening requirements. In an increasingly electronic era, what could be more original than the old-fashioned approach where everything old is new again?